This premier online showroom template is perfect for your shopping needs, great for showing off your wares in an attractive webstore that keeps things simple but also uses effective product showcases to highlight your items. Support for Virtuemart means there's a huge amount of options for improving the customer experience, and managing your store is simplicity itself. For those of you who like to get out on or off the road, Bike Store comes equipped with the right stuff to boost your sales. 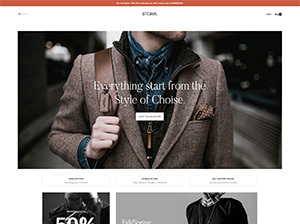 Made with cycling in mind, smooth shopping options and responsiveness that makes this theme stand out, and allows users to shop wherever they are on any screen size. Your bikes or other products should be the focus to help your customers get what they need and get back to the great outdoors, so we’ve made this webstore theme as unobtrusive and understandable as possible. By avoiding unnecessary clutter your inventory can take center-stage. To get your wares front and centre, our NSP module integrates effectively with VirtueMart and forms direct showcases in several styles that get straight to the point. Pagination options means you can get a massive amount of products on the frontpage without overfilling the available space for rapid browsing. Custom HTML elements add extra information to assist your customers; advertise great benefits like free shipping, provide contact details and opening times so visitors know what to expect, and tab options let you pack even more information on your biggest brands on every page, encouraging further investigation and exploration.